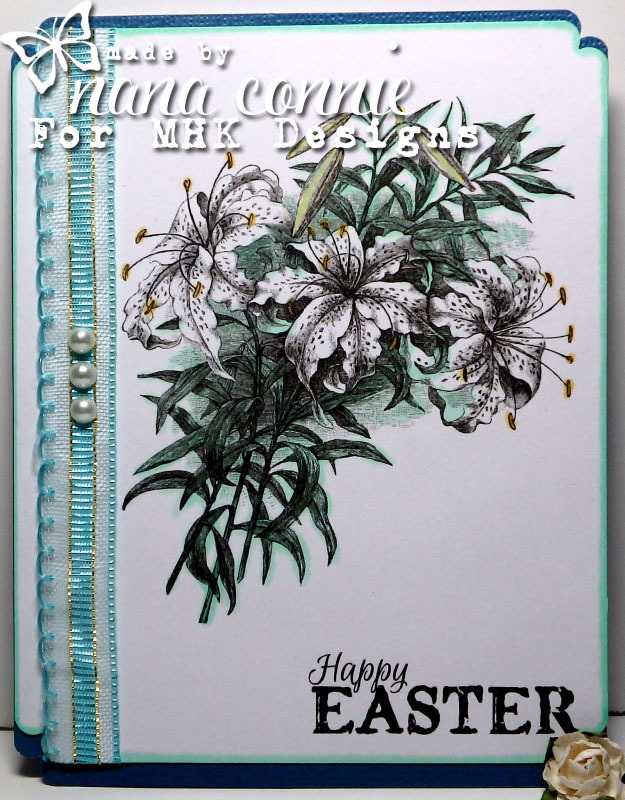 This is the last of the five newly released sets from MHK Designs this month and one of the most beautiful, I think. The set is called "He is Risen" and you can see a photo of it at the end of this post. This is a single layer card with the image and the sentiment printed right onto the card front. I used chalk markers and colored pencils to color the image and chalk markers to ink the edges of the card. The corners are shaped with a punch. I added lace ribbon from my stash and the three pearls. That's all -- very simple card design. 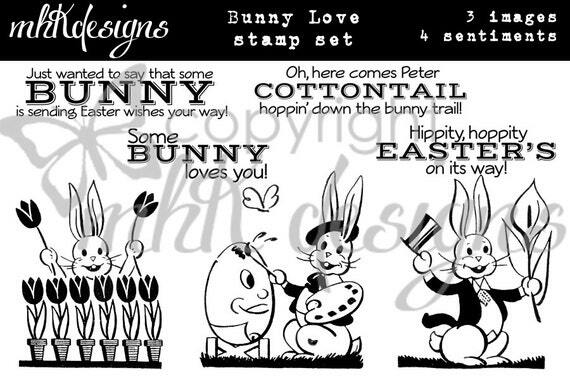 This is the fourth new release set from MHK Designs this month and it's called "Bunny Love." 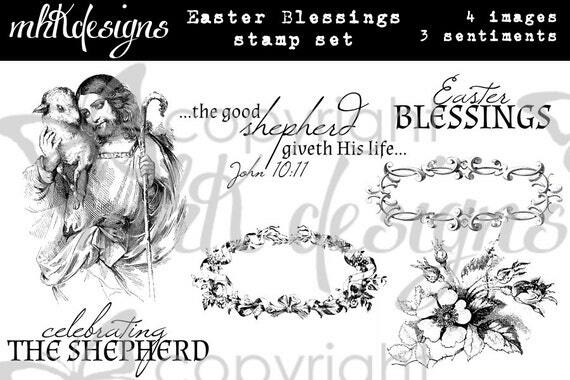 There are three separate images (most of which work well for spring or Easter) and four sentiments included in the set. If you scroll all the way to the bottom of this post, you'll see a photo of the complete set. Here's my card using the Bunny with Lily image. This is a pretty CAS card design. 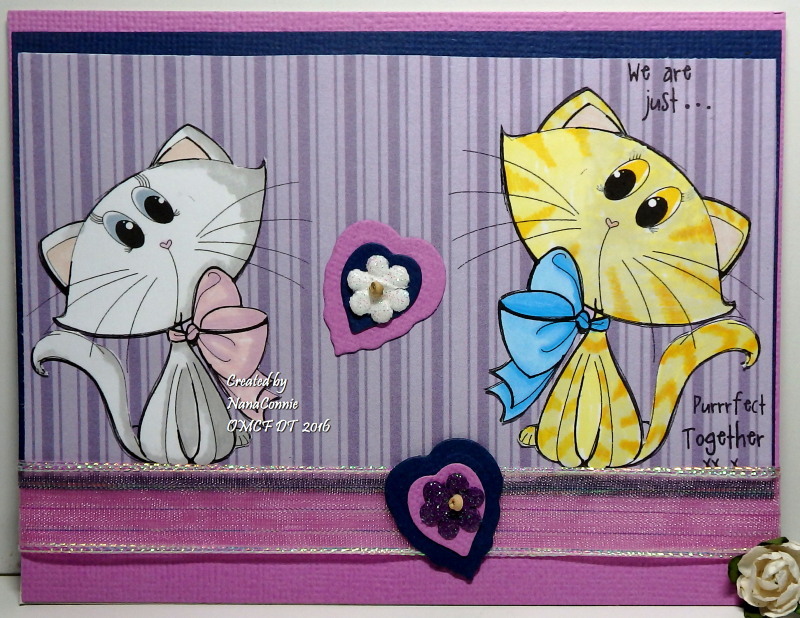 I used ProMarkers to color the image and cut it with a die from Spellbinders. I also cut the mat with another larger die from that same set. The sentiment was printed and die cut, but hand trimmed along the bottom. I used a Cuttlebug embossing folder on the green CS and chose to mount it on an angle for a little visual interest. 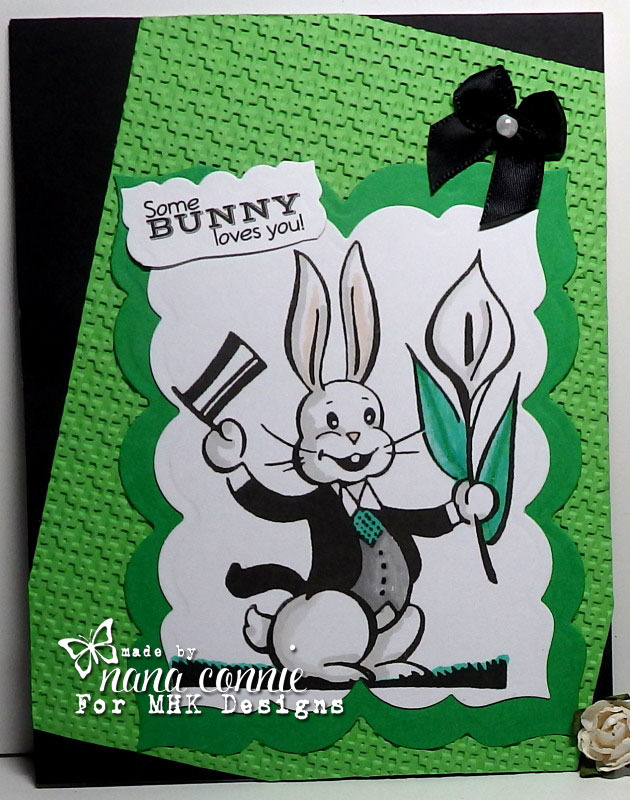 Everything went onto a black card base which brought out the black in the bunny's tux and top hat. The black bow is one of those I make by the dozens and keep in my stash for use as I need them. 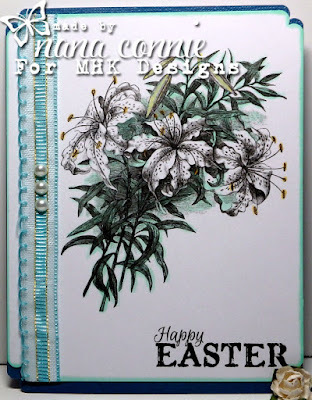 Day Three of the February release at MHK Designs and the first of my Easter cards. This spectacular image of the Good Shepherd is from the set called "Easter Blessings." The sentiment is also from that same set. Check the bottom of this post to see a photo of the entire set. this image into a diamond shape. When I first began designing this card, I was thinking about how to color the image but the more I looked at it, the more I decided there wasn't much I could do to 'improve' it so I decided to leave it black and white; color could be added through the papers and embellishments I chose. I cut the image with a die from Spellbinders and backed that with a Swiss Dot embossed piece of CS. I layered that onto a background of blue dp from the MHK Designs "Going Gingham - Brights" set. I added some of my favorite sheer ribbon (Really Reasonable Ribbon) and also used it to tie a triple loop, triple layer bow - a perfect handmade embellishment! I finally inked the edges of the card and it really gave it a finished look. 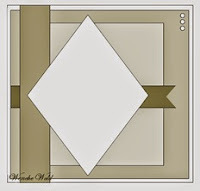 If you're looking for the second February release from MHK Designs, please scroll down one post. Printed onto pastel parchment paper (not vellum but actual parchment, for those of you in the UK :-D), then colored with chalk, Copics & gel ink. The bit of lace was a scrap left over from a blouse I made recently, and the ribbon for the bow was also in the bin filled with other scraps. I tied it and then added the two pearls. 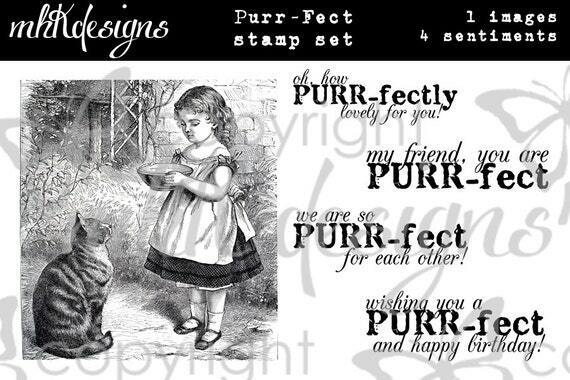 Today Mynn has released this adorable set called "Purr-Fect." You can see the full set at the bottom of this post. Here's my card using this precious image and one of the sentiments. I used chalks and ProMarkers to color this one and decided on pink as the primary color because I wanted to celebrate the kind of love that happens between a girl and her cat. Can't you tell these two are BFFs? I used a Darice embossing folder on the background CS and the black grosgrain ribbon came from Really Reasonable Ribbon. Fairly CAS but I think it looks suitably vintage and almost elegant. Last month, I joined the MHK Designs DT and this is the first month I've gotten to celebrate a new release from the shop. From today through Saturday, you'll see a newly released set each day and they are all so wonderful. 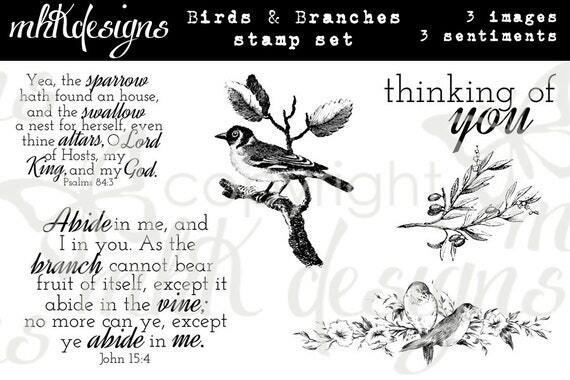 We start with the "Birds n Branches" set which has 3 images and 3 different sentiments. 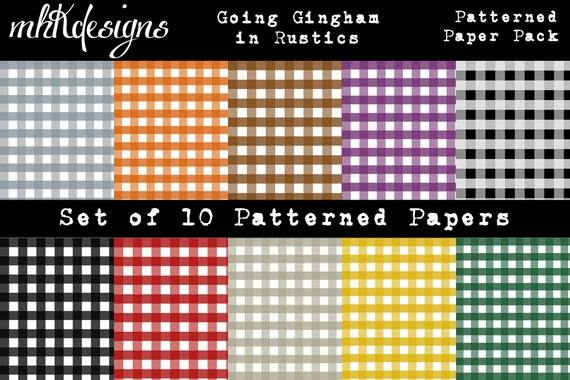 I also used one of the MHK Designs papers from the "Going Gingham - Rustics" set (pine.) See below for photos of both the sets. The octagon is cut with a die from QuicKutz. The sentiment is printed and hand cut. I tied a two-color, double bow (left over scrap ribbons from my stash) and used it as the only embellishment. I really wanted to show off the image and that lovely gingham paper so left it as simple as possible. Much as I appreciate shaped cards, I still love the basic A2 card for size and shape; a single fold and a perfect size card for mailing without extra postage. Edited to add: I have several posts pre-scheduled and that's a good thing because, due to an injury, I'm currently unable to type or craft or even leave comments. I can visit your blogs but leaving comments is just not going to happen. Hopefully, I'll be back to normal in 2 or 3 weeks. 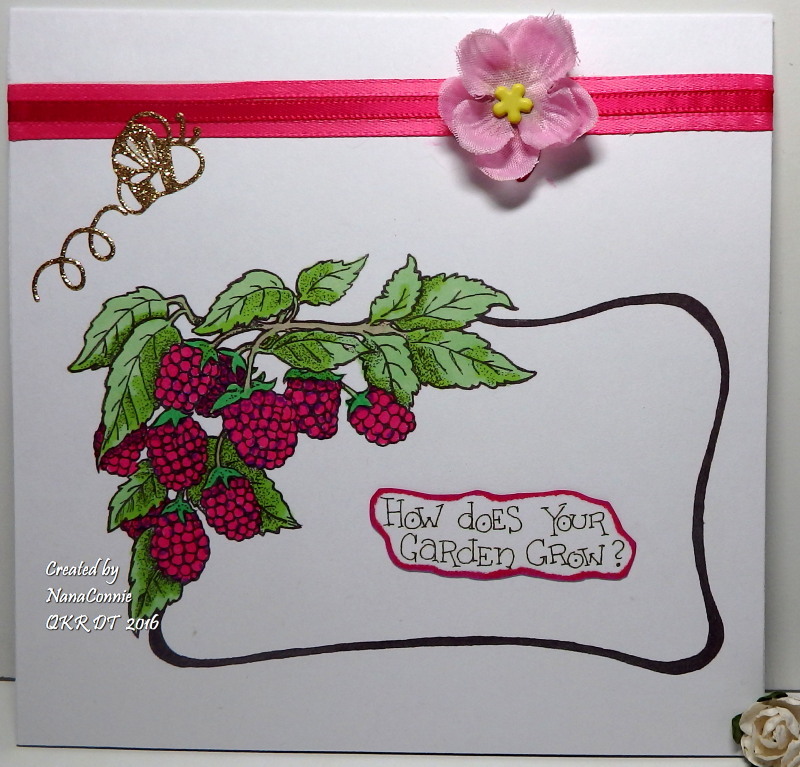 I think this is the first of my spring cards, but it may actually be a card which celebrates summer berries more than spring. Raspberries are a favorite and the new challenge theme at QKR Stampede this week was a perfect opportunity to use this fabulous Raspberry Label image (Digi 17901.) Our theme is "Yummy, Yummy" and we want to see you include food on your cards. 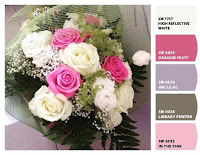 (Green plus choose 2 from photo - pink & white). I also used Digi 12407 "Garden Grow" for the sentiment. 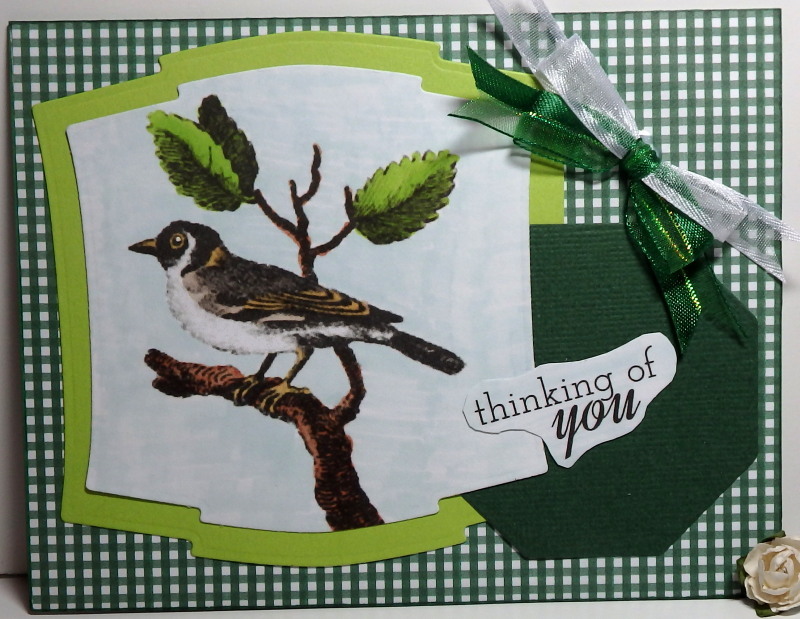 The image and sentiment are printed directly onto the card front, making this a one-layer card. I used my ProMarkers to color the image and to outline the sentiment. I added the bee, the ribbon, and the handmade flower with a yellow brad for embellishments. Overall, it's still a very CAS card. 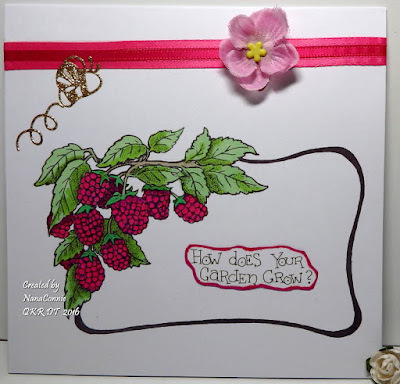 Mmmm, don't I wish those raspberries were growing in my yard right now! The image is from Nutcrafters and I used my ProMarkers to color it. It's cut with a die set from Spellbinders, as are the mat and the sentiment. The twine was in my stash and is another salute to Lynn because she uses twine a lot. Open-Minded Crafting Fun starts its February challenge today and it will run throughout February and into March. New challenges begin there on the 10th of each month. This month, we have a theme of "Love" or "Valentines." Even after Valentine's Day is over, we can always do with a bit more Love to share. We have four great sponsors this month; All Dressed Up, Ppinky Dolls, SLS Lines, and Zuri Artsy. 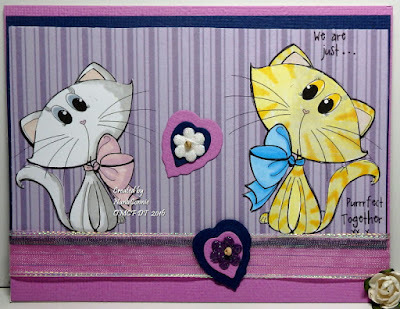 I am using a darling image from All Dressed Up called "Purrfect Together." I loaded the image once, using MS Word, and then loaded and flipped it for a second image. I sized one slightly larger than the other so that I could use them as a cute couple. I printed them onto white CS and then printed them again onto the background dp (I love how it looks almost like wallpaper! ), including in that printing the sentiment which came with the image. I had a friend ask me if I could make an anniversary card for a couple who got married on Valentine's Day 50 years ago. 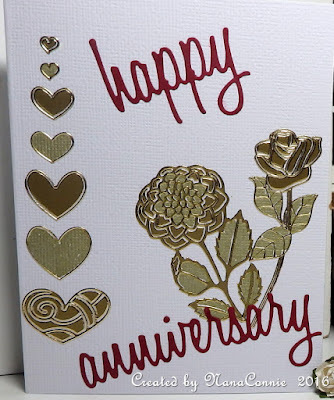 I knew that 'Golden Anniversary' would be a great theme and decided on gold embossing powder before I even looked at what I might use image-wise. Here's the end result. In addition to the gold embossing, I decided on a touch of red as a nod to Valentine's Day. On the gold, what wasn't heat embossed was colored with metallic ProMarkers. The sentiment was cut with a die from Memory Box. It's time for the February challenge at Quirky Crafts! Remember, all our challenges will begin on the first Sunday of the month and end on the 28th day of that month. We will also publish a reminder on the third Sunday of each month. We have a new theme this month: Let's "Quirky use Red OR Pink + black AND white." How easy is that? This month, we have "The Cutting Cafe" as our fantastic sponsor and they generously supplied digis and .svg files to the DT. so I used them and added hearts for their twist. 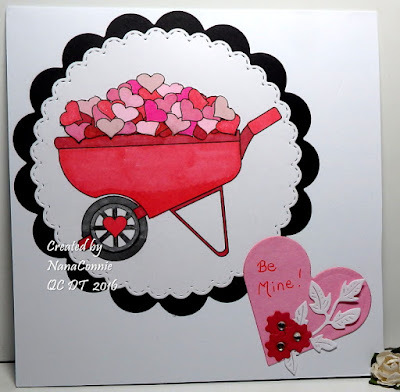 I used the basic wheelbarrow, colored it with ProMarkers, then die cut it (stitched die - Lawn Fawn, scalloped circle die - Spellbinders). I fussy cut the hearts (part of the sets from The Cutting Cafe) and added them to the wheelbarrow (since I don't have anything that uses .svg files.) I also fussy cut and added the wheel which has a heart on it. I love that these Cutting Cafe files can be used either with a machine or by fussy cutting! The heart with the sentiment is another die cut (Spellbinders) as are the leaves (Cheery Lynn.) I made the little flowers by punching the shapes and adding a gem to the center of each one. I have something really different from my usual 'style' this morning and I had so much fun stepping outside my norm. No, that doesn't mean I've suddenly become "abnormal" but who knows where it could take me? although I kept it much more simple. The heart is a cling rubber stamp I found somewhere and it's been bouncing around in my collection, new and unused, for more than 5 years (shame on me.) There's no identification on the stamp so I have no idea who made it. I stamped it onto vellum with VersaMark ink and used silver EP to heat emboss it. Then I colored it with my ProMarkers and, what do you know, it looks like stained glass! Before I fussy cut it (no easy chore but do-able because of the embossed outline), I put it onto sticker paper and then cut it out. After it was fussy cut, I peeled off the backside paper and adhered it to the card front. That meant there was no tape to show through the vellum, something I really dislike and one of the reasons I don't use vellum very often. Now that I've discovered this technique, I may use it more. The smaller roses were stamped directly onto the card front and colored. You can see how different they look when compared to the the vellum and heat embossing. 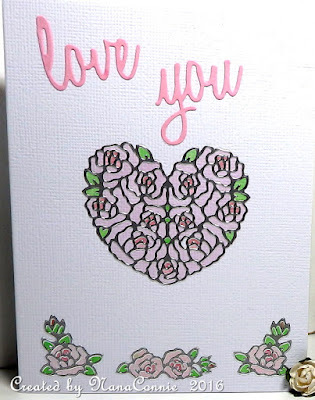 The "Love You" sentiment is cut with a die set from Sizzix. I didn't want anything to take away from the stained glass heart so I added no embellishment at all. OK, you have a little over a week to get all your Valentine cards ready and we're going to encourage you over at QKR Stampede with a theme of "Valentine Cards" this week. How can you miss with a theme that general? 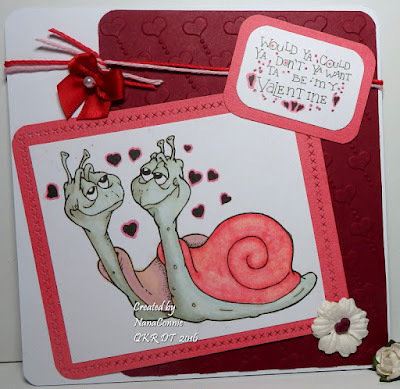 My card is made using a wonderful image and fun sentiment, both from QKR Stampede; 6905 "Totally in Love" and 14513 "Valentine." 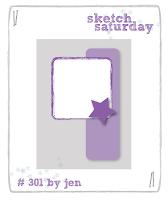 and Sketch #301 from Sketch Saturday. 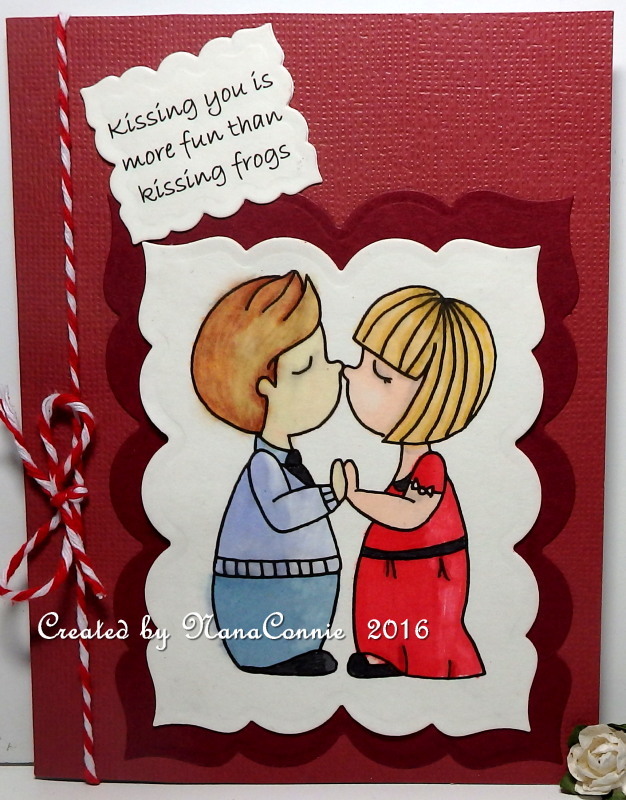 The image is colored with my ProMarkers and cut with a rectangle die (Spellbinders.) The mat is cut with a stitched rectangle die from Lawn Fawn. I used a Darice embossing folder on the darker panel. The card is embellished with a flower, a button, twine, and a bow with a pearl. 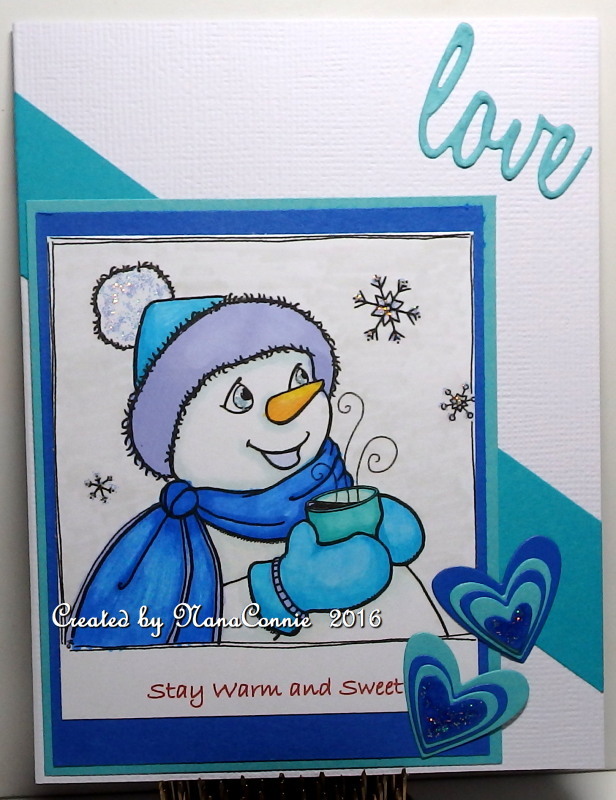 I wanted to try something a bit different today so I made a card that focuses on Love but did it all in wintery blues. What do you think? I added glitter (which barely shows in the photo) to the snowflakes, the tassel on his hat, the top layer of the hearts, and his eyes. IRL, it's very sparkly. :-D I decided that was enough embellishment and kept it pretty CAS. At Tuesday Throwdown this week, we want to see you do 'Paper Piecing.' Our sponsor is Robyn's Fetish and I've used "It's Bearly Love" as the image for my card. and used colors from Can You Case It? 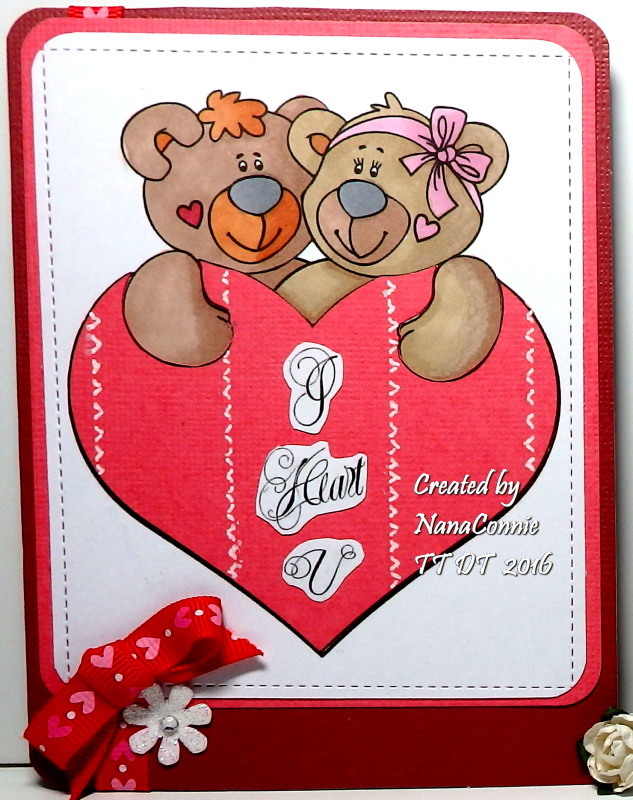 The bears are colored with ProMarkers and Copics, then cut with a stitched border die from Lawn Fawn, one of my newest acquisitions. I've gone crazy getting more stitched dies and this is the latest one. The heart is paper pieced. I matted the image with CS from Recollections and rounded the corners to match the image piece. I added a ribbon and bow (Really Reasonable Ribbon), plus a glittered flower from my stash. I also rounded the corners of the card itself.